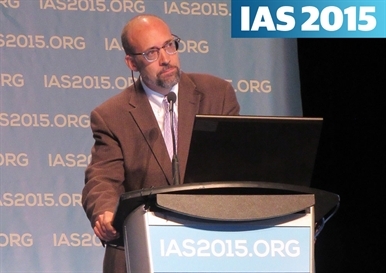 A programme at San Francisco General Hospital that offers antiretroviral therapy (ART) on the same day as HIV diagnosis led to a high rate of treatment uptake and more rapid viral load suppression compared to standard practices, according to late-breaking study findings presented on Wednesday at the Eighth International AIDS Society Conference (IAS 2015) in Vancouver, Canada. Newly diagnosed people with HIV and clinic providers both expressed enthusiasm about the RAPID programme, which is now being implemented more widely as part of the city's 'Getting to Zero' initiative. Studies have convincingly shown that early antiretroviral treatment improves the health and survival of individuals living with HIV and has the added public health benefit of reducing HIV transmission. But getting people into care can be challenging and some are lost at each stage of the HIV care cascade. Christopher Pilcher of the University of California at San Francisco presented results from the UCSF/SFGH RAPID program, which aims to provide ART as soon as possible after people are diagnosed with HIV – focusing on the "very left side of the continuum of care". In 2010, San Francisco was the first city to recommend universal ART for everyone diagnosed with HIV regardless of CD4 cell count. A similar recommendation was included in US treatment guidelines in 2013 and will soon be incorporated into the World Health Organization's global guidelines. Compared with many other cities, San Francisco has a well-financed HIV care system with experienced and culturally competent providers. Yet even with these advantages, the process of getting tested, addressing other issues that may be barriers to treatment (such as substance use or unstable housing) and figuring out how to pay for medication can take a considerable amount of time – delays that could lead to disease progression and HIV transmission while viral load is high. In the late 2000s, when treatment initiation was based on CD4 count, it took 128 days on average for people diagnosed in San Francisco to get a prescription for ART and 218 days to achieve viral suppression (<200 copies/ml), Pilcher noted as background. After the standard of care shifted to universal treatment in 2010, it took 37 days to get ART and 132 days to attain viral suppression. The RAPID initiative was designed to speed up this process by collapsing some of the steps of the care continuum, Pilcher explained. Instead of HIV diagnosis, initial assessment and counselling, medical evaluation and ART prescription being done over the course of multiple visits, these steps were consolidated into a single visit. This study looked at outcomes in a demonstration project assessing the feasibility of this rapid approach. The analysis included 227 people newly diagnosed with HIV. Of these, 39 participated in the RAPID programme between July 2013 and December 2014. They were compared to people in historical standard-of-care groups that received universal ART during 2010-2013 (n = 149) or CD4-guided treatment during 2006-2009 (n = 39). RAPID was initially designed to offer prompt treatment for people with acute HIV (infected within the past six months), as studies have shown that very early ART can limit the size of the viral reservoir. It was later expanded to include people who are newly diagnosed with HIV but have been infected longer, and who have an indication for urgent treatment such as an opportunistic illness or CD4 count below 200 cells/mm3. In this analysis, 70% of RAPID participants had acute infection. Overall, Pilcher described the RAPID clients as a "high needs" population at risk of falling through the cracks of the healthcare system. All were men, 59% were people of colour, more than a quarter were homeless and none initially had health insurance. The average CD4 count was 474 cells/mm3 and the mean viral load was high at 4.9 log10 copies/ml. This analysis included people who came in as outpatients, excluding those who started as inpatients or transferred from jail or another clinic. People are typically referred to the RAPID programme by one of the city's public HIV test sites, which routinely do HIV RNA testing. People are generally referred to the programme the same day they receive their HIV diagnosis, though in some cases this occurs days to weeks after they actually take the test. All newly diagnosed people receive multidisciplinary services including social support, HIV education and mental health counselling, as well as having samples collected for laboratory tests. The RAPID programme tries to minimise barriers that could discourage engagement, such as requiring people to be abstinent or undergo substance use or mental health treatment before starting ART. RAPID participants receive same-day appointments and access to an on-call provider, along with taxi vouchers if needed to get to the clinic. They are given a five-day starter pack of antiretroviral medication and encouraged to take the first dose on the spot under the observation of their provider. Most patients wanted same-day treatment; 90% opted to start ART on the day of the first visit, with another 5% starting the next day. On average, it took about one day from test result disclosure to taking the first pill. In contrast, in the historical standard-of-care groups only about a quarter started therapy within the first week and about 60% did so within the first month after the initial visit. Treatment is usually offered after a brief medical evaluation but before lab test results including drug-resistance data are available. Providers choose from a list of pre-approved regimens based on local patterns of transmitted drug resistance. The prevalence of transmitted resistance is substantial in this population, with more than 20% having major NNRTI resistance mutations. Most people (90%) started treatment using an integrase inhibitor. Meanwhile, programme counsellors helped participants establish ongoing insurance coverage. Most RAPID participants qualified for publicly funded coverage such as Medicaid or the city's Healthy San Francisco programme, but some were eligible for private insurance. Participants in the RAPID programme achieved viral suppression in a median of 56 days, compared with 119 days for those in the universal ART standard-of-care group and 283 days in CD4-guided treatment group. After three months on ART, 75% of RAPID participants achieved viral suppression, compared with 38% in the two standard-of-care groups. After six months, the corresponding response rates were 95% vs 70%. Among the first 39 participants who received treatment through the RAPID programme and were followed for up to 18 months, only two (5%) changed their ART regimen due to toxicity and none discontinued therapy. Pilcher said it is difficult to evaluate long-term engagement in a study of this length, but it appears favourable so far, with 35 participants (90%) remaining engaged in care. "It was feasible to implement same-day ART initiation for outpatients with newly diagnosed HIV in a well-resourced, public health clinic setting," the researchers concluded. "Same-day ART was highly acceptable to both patients and providers" and "was associated with improved rates of virologic suppression." Pilcher said that participants overall had "extremely positive" reactions to the programme. He added that he had expected some resistance or push-back from providers who were reluctant to start treatment so early, but this did not occur – in fact, the programme was met with "extreme enthusiasm." The RAPID programme has become of one of the three prongs of the city's 'Getting to Zero' effort, which also includes expanded pre-exposure prophylaxis (PrEP) and efforts to retain people with HIV in care. Diane Havlir, chief of the division of HIV/AIDS at SFGH, said the initiative aims to expand same-day treatment to all public and private providers citywide. Pilcher C et al. Providing same day, observed ART to newly diagnosed HIV+ outpatients is associated with improved virologic suppression. Eighth International AIDS Society Conference on HIV Pathogenesis, Treatment, and Prevention (IAS 2015), Vancouver, abstract WEAD0105LB, 2015.